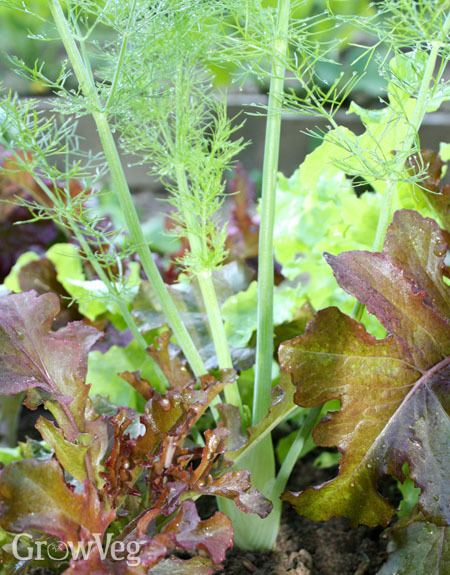 Beautiful, flavorful and easy to grow, fennel has been a treasured culinary and medicinal herb for thousands of years. Native to the Southern Mediterranean, fennel is now grown as an annual, biennial or short-lived perennial in gardens around the world. Fennel is regarded as a weed in Australia and the Western US, but if you harvest some of the yellow flowers to dry into fennel pollen, and then gather the ripe seeds, fennel will never have a chance to become a thug. All parts of the fennel plant are edible, from its tender leaves to its plump seeds. Most gardeners favor bulb fennel, grown for its crisp, celery-like stems, and plants that bolt produce harvestable flowers and seeds. The leaves of bulb fennel are just as tasty as those from herb fennel, and bulb fennel’s compact size make it an easy fit in small gardens. Herb or sweet fennel and blushing bronze fennel are taller plants that soften any scene with their feathery texture. Fennel pollen has been a trendy spice among chefs since before 2011, though Italian cooks have used it as a dry spice for hundreds of years. Boasting the complex citrusy-licorice flavor of fennel in concentrated form, fennel pollen includes the pollen and dried petals that fall from fennel blossoms as they dry. To harvest fennel pollen, snip several heads of blooming fennel into a clean paper bag, and place in a warm, dry place for at least a week. Give the bag a good shake, and gather the pollen and petals that accumulate in the bottom of the bag. When stored in an airtight jar in a cool, dry place, fennel pollen will store for several months. You will want to leave some flowers behind to produce seeds for cooking, and the flowers will provide nectar for many beneficial insects. In a 7-year study in the Crimea, eight species of beneficial wasps were observed gathering nectar from fennel. Hoverflies like fennel, too, and it is a preferred host plant for the larvae of black swallowtail butterflies, commonly known as parsleyworms. I would much rather see them on a towering fennel plant than on my petite little parsley! Much of the research that has validated fennel’s health benefits has been done with fennel seeds, which are rich in antioxidants and have anti-inflammatory effects. Fennel seeds have long been used to reduce intestinal gas, which is why many cooks add a few fennel seeds to the cooking water when cooking asparagus, cabbage, beans, and other gas-producing foods. When taken as a nutritional supplement, fennel capsules can reduce common symptoms of menopause. Or you might try fennel to lose weight. Writing in 1650, English botanist William Coles described using fennel “in drinks and broths for those that are grown fat, to abate their unwieldiness and cause them to grow more gaunt and lank.” Well, he may have been right. In a recent Korean study, overweight women reported wanting to eat less after drinking fennel tea before a big meal. To try it yourself, use fennel leaves, seeds or both to make an infused water to sip through the day. For some gardeners, making friends with fennel requires moving beyond several widely believed myths. For example, the often-repeated spook story that fennel and dill will cross is false. Despite their physical resemblance, fennel and dill are different species, with chromosome numbers that don’t match. Fennel is also often blacklisted as a murderous companion to other crops, but fennel’s ability to inhibit the growth of its neighbors is wildly exaggerated. In one study in which fennel and 15 other herbs were tested for their ability to suppress the germination and growth of lettuce, fennel was no more potent than lavender. Fennel seed coats do contain substances that inhibit germination of other seeds, and it is possible that natural herbicides of the future could use highly concentrated fennel seed extracts as their active ingredient. Some myths cannot be tested, so it may be wise to hang boughs of fennel over your door on Midsummer’s Eve to ward off evil spirits, or at least spritz your door with some fennel tea. With some things, it is better to be safe than sorry. "Grow it to attract Swallowtail caterpillars!"